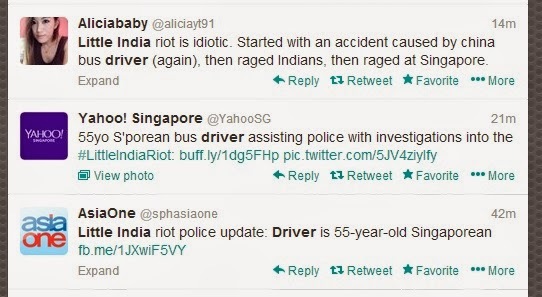 S M Ong: 5 Little India riot myths – debunked! The trouble is not just that we believe things that aren't true – it's that we now also spread the untruths online. 1. The man killed by the bus was not Bangladeshi. 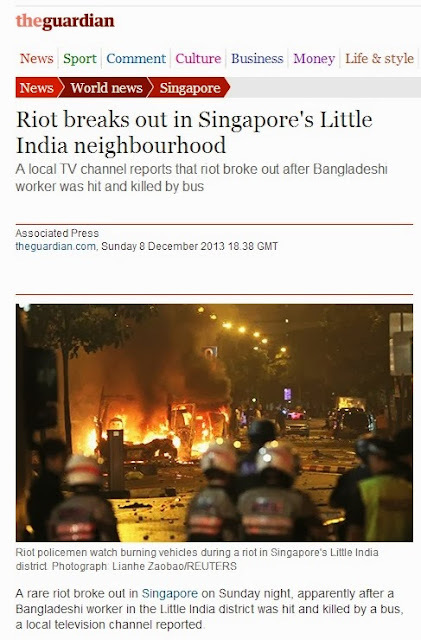 The Bangladesh High Commissioner in Singapore has issued a statement refuting some media reports which state that a Bangladeshi worker was involved in an accident which triggered the riots. It said: "In some press and media reports there has been unsubstantiated news reporting which says that a Bangladeshi worker was hit by a bus that escalated the riot incident." "I want to categorically state that as per available information the news reports that appeared on a section of media and news involving a Bangladeshi worker is not based on facts." 2. He was not decapitated. The 33-year-old Indian national who died in the fatal accident, which sparked the Little India riot on Sunday night has been identified. Mr Sakthivel Kumaravelu has been working in Singapore as a construction worker with Heng Hup Soon, a scaffolding company, for about two years, said a man who identified his body at the Singapore General Hospital (SGH) mortuary on Monday morning. The man, who declined to be named, said Mr Kumaravelu's family has not been notified of his death. He added that Mr Kumaravelu's body was not decapitated as reported by some news outlets but he did suffer injuries to his face. 3. The bus driver is not from China. He is Singaporean. The driver involved in the Little India accident on Sunday night that sparked a riot has been arrested and is out on bail, police said on Monday. The male Singaporean driver, who was warded at Tan Tock Seng hospital earlier today, is being investigated for causing death by a negligent act. He is understood to have been ferrying workers between Little India and a dormitory at Jalan Papan when he reversed into Mr Sakthivel Kumaravelu, a 33-year-old Indian national. The deceased is believed to have been drunk. Also, the driver is not a woman. 4. 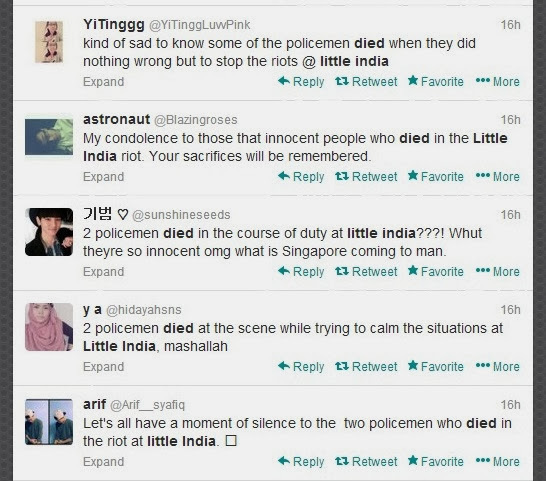 Policemen were not killed. Police investigations revealed a fatal traffic accident had occurred between a private bus and a pedestrian at the junction of Race Course Road and Hampshire Road. Shortly after, a riot broke out involving a crowd of about 400 subjects where the subjects damaged several vehicles including 16 police vehicles. About 300 Police Officers, including those from the Special Operations Command and the Gurkha Contingent, responded to the scene. As of noon today, 22 Police Officers and 5 Auxilliary Police Officers have sought treatment at the hospital. The officers sustained injuries and lacerations. All of them have since been discharged from the hospital. The shooting happened in 2008. 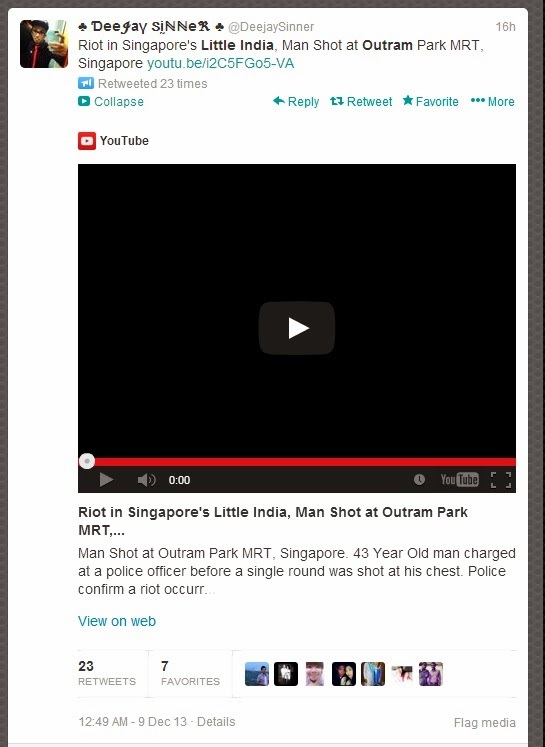 EARLIER: Singapore's first YouTube riot in Little India?